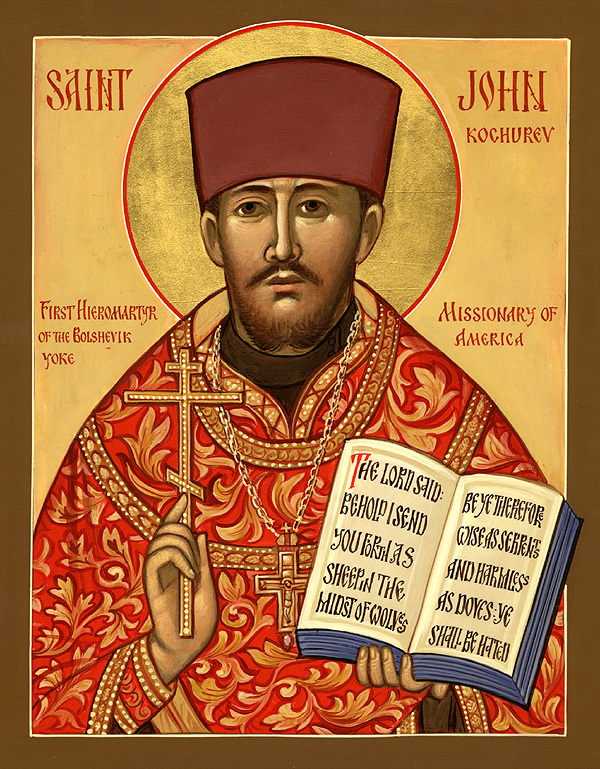 The hieromartyr (priest-martyr), St. John Kochurov, is one of the nine saints who were born in other countries and came to America as missionaries, whom we venerate as American saints. St. John paid the ultimate price for his dedication to the service of God and His Holy Church: he was the first priest to be martyred by the Communists in the Russian Revolution in 1917. The future saint was born in 1871, the son of a priest, in a village in the Ryazan region of Russia, southeast of Moscow. 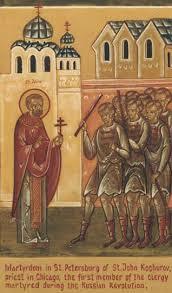 Completing his studies at the Ryazan Seminary, the studious young John went to the St. Petersburg Theological Academy. After graduating in 1895, he married, and was ordained priest by Bishop Nicholas of the Aleutian Islands and Alaska, the head of the Russian Orthodox Church’s mission in North America, who was looking for missionary priests for America. Father John was eager to serve as a missionary in the United States, and so he was sent to America after his ordination, where he served under Saint Tikhon, when he became bishop of North America in 1898. Father John was assigned as priest of the Holy Trinity parish in Chicago. 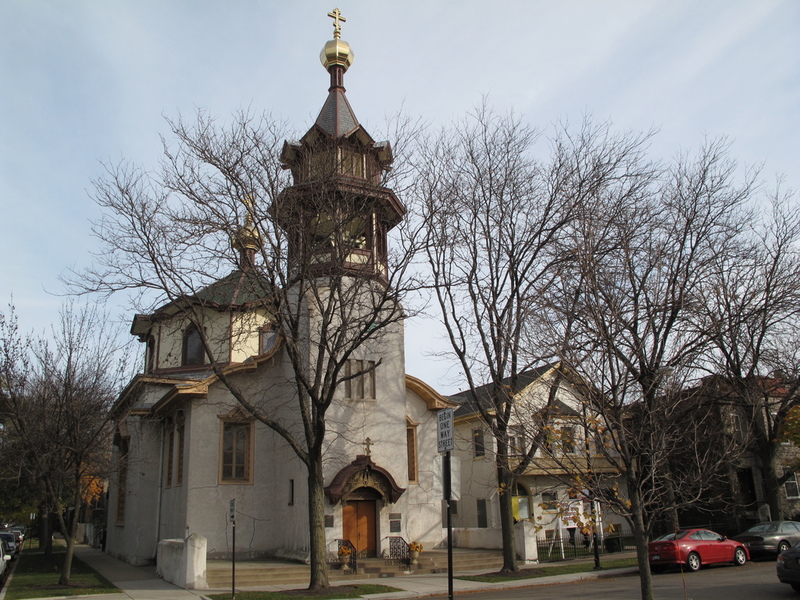 In 1899 he commissioned the famous American architect, Louis Sullivan, to design a new church, which was consecrated by Bishop Tikhon in 1903. Today, the beautiful historic landmark, the Holy Trinity Cathedral, is the seat of the bishop of the Midwest Diocese of the OCA (photo to left). Father John also was instrumental in forming a number of parishes: in the Chicago area; in Burbank, Joliet, Madison and Streator, Illinois; in Buffalo, NY; and in Hartshorne, Oklahoma. Also, he studied the Carpatho-Rusyn language of the many Slavic Uniate immigrants, so he could do missionary work among them, as they were returning to Orthodoxy, thanks to the work of St. Alexis Toth of Wilkes-Barre. A popular teacher and preacher, Father John’s great labors on behalf of Orthodoxy in America also included: translating Orthodox literature into English; serving as Dean of the mid-west parishes; working actively in the Orthodox Brotherhood and Mutual Aid Society, which were so vital to the survival of Orthodox immigrants at the beginning of the twentieth century; and helping to organize the first Church Council in North America, convened by Archbishop Tikhon in 1907. In 1907 Fr. John was transferred to Russia, first to Estonia, and then in 1916, to Tsarskoye Selo (the Tsar’s primary residence), near St. Petersburg. In 1917, the Communist Revolution broke out. In October the Communists attacked Tsarskoye Selo. The people flocked to the churches to pray. Fr. John held a prayer service and then led a cross-procession through the streets to pray for peace and an end to the violence and lawlessness. Some accounts say that he was killed then by the Communist mob, and other accounts say that the next day he was arrested and executed. Saint John lived for Christ, and died for Christ, putting Christ above all else, thus providing an example of faith for us to follow.